You know summer has arrived when you bite into that first red, juicy strawberry from your garden or local farm. 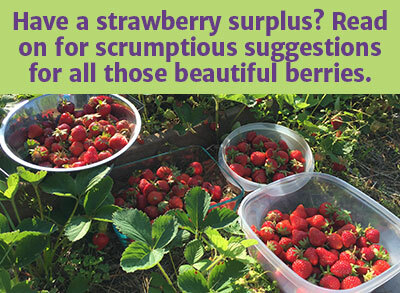 But when you set the big basket of strawberries on your kitchen counter, you might be wondering what to do with all that fruit! We have a few tasty, healthy strawberry recipes for you, as well as a simple method for freezing any extras. Strawberries can be loaded with pesticides and have consistently made the Dirty Dozen list, so choose organic only or grow your own — strawberries are easy to grow and the plants are quite prolific. The Paleo diet is anything but a fad. This is the way people lived for thousands of years, and those that adhere to the diet have noticed numerous health benefits from eating the way our ancestors did. Eating Paleo does not mean you have to miss out on your summertime favorites though! Try this delightful Strawberry Shortcake made with almond flour and coconut milk for a sweet, refreshing treat. Whisk dry ingredients together in one bowl and wet ingredients in another. Pour the dry mixture into the wet and use a spoon to stir together well. Refrigerate the batter for 10-15 minutes. Preheat the oven to 350°F and line a cookie sheet with parchment paper. Once the batter has cooled, spread it into a square shape on the cookie sheet. Cut the square into 9 pieces and (like a tic-tac-toe board) and slide each piece so that they are all 3/4 inch apart from each other. Bake for 15-20 minutes, until cake is a light golden brown. Allow to cool and then top with strawberries and coconut whipped cream (below). Adapted from Perfect Supplements blog. Wash strawberries and remove the tops. Halve the strawberries. Sweeten to taste, mixing in 1-3 teaspoons of maple syrup, honey, or other sweetener for every cup of strawberries. Let sit at room temperature for at least 2 hours, then refrigerate if desired. For this whipped cream you will need a can of full-fat coconut milk or coconut cream, with no added guar gum. Place the can in the refrigerator overnight. It is really important not to skip this step and not to buy “light” coconut milk or one made with guar gum, as you want the cream to separate from the liquid. When you remove the can from the fridge, be careful not to shake it up or tip it. Open the can and spoon the thick cream off the top and into a chilled mixing bowl (you can save the watery liquid for another recipe). Beat for a minute, then add 3 tablespoons of maple syrup and a 1/2 teaspoon of vanilla. Continue beating until the cream is smooth and fluffy. Use immediately, or store in the fridge for 1-2 weeks. If you refrigerate it, the cream will harden, so whip it again before use. This is a vegan, gluten-free strawberry jam recipe made with energizing, omega-rich chia seeds. Chia seeds are an excellent source of protein, fiber, and minerals, and since they absorb tons of water, they naturally thicken this easy, no-cook strawberry jam. Wash strawberries and remove stems. Mash the strawberries, or blend if you prefer a smoother consistency. Mix in water and chia seeds. Add sweetener of choice, a little at a time, tasting until you’ve reached the desired sweetness. Pour into a jar and refrigerate for one hour before use. Store in the fridge for about a week, or make a big batch and freeze some for later. 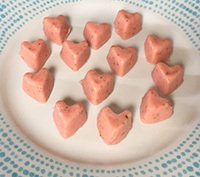 These strawberry lemonade gummies are a fun summer treat, and a great way to incorporate gelatin into your family’s diet! Grass fed gelatin is excellent for supporting joint health, reducing inflammation, and healing the gut, plus it provides essential amino acids and protein. Combine strawberry puree, lemon juice, and sweetener in a small saucepan. Heat on medium-low just until warm, not hot or boiling. Add gelatin and whisk well or blend with an immersion blender to dissolve gelatin. Pour the mixture into silicon candy molds (you can also use a greased square pan and cut into squares once set). Freeze for 15 minutes to set. Enjoy your strawberries all year long by storing them in your freezer. Simply wash strawberries well and cut off the tops. Spread the strawberries on a cookie sheet in a single layer so that they won’t stick to each other, and place the tray in the freezer. Once the strawberries are frozen solid, transfer to an airtight container. You can use the frozen strawberries in smoothies, yogurt, and favorite recipes right through the winter!